Sr. Judy was fully engaged with the students whom she is helping in her social program, for their next high school semester. she is pictured with three orphans; the girl to her right is Alice, whose mother Milcah was sitting every day for 12 hours guarding a generator, for less than 10 cents a day; the fifth student at the top of the picture has also an extremely poor background. 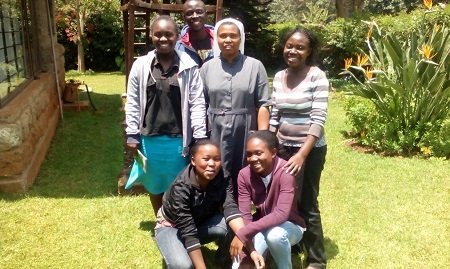 Sr. Judy's concern is always: "Others are waiting for my help, but…Who could support these young people with a stipend of $2/year for a good education and thus a good start in life?